A undergraduate student wishing to pursue a major in Jewish Studies at Penn may choose among four options, each of which concentrates upon a different intellectual approach to Jewish civilization in its various aspects. The interdisciplinary major allows students to study Jewish history, literature, religion, and culture in a program that integrates these different dimensions of Jewish civilization from the various disciplinary perspectives of Jewish Studies. The major normally consists of 14 c.u.s though double-majors may apply to have the requirement reduced to 12 c.u.s. Please note: Transfer credits (including all study abroad courses) are limited to 4 c.u.s for the Interdisciplinary major. Proficiency in Hebrew or Yiddish language, which can be attained either by studying these languages at Penn and completing the last level, or for Hebrew, by passing out of the requirement through the placement exam. For Hebrew proficiency a student can also have scored 700 and above on the Hebrew Achievement Exam (SAT II), or have gained an Israeli Baccalaureate. Both modern and Biblical Hebrew language courses -- including JWST 059 -- may count towards the major as language or elective courses but not for the modern Jewish literature requirement. In special circumstances, students may petition to have another language substituted for use in the major. Three courses in Jewish history, from at least two different periods (ancient, medieval/early modern, or modern) which normally will include at least two semesters of either JWST156/HIST 139; JWST157/HIST140; or JWST158/HIST141. 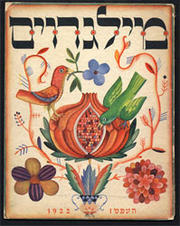 Three courses in Jewish literature. These courses may be either in the original language or in translation, but they must include at least one course from the Biblical period; one from the Rabbinic or Medieval periods; and one from the Modern period. Three courses in Jewish religion or culture, including courses in political science and Middle Eastern studies, folklore, sociology, archaeology, and anthropology. Note: Courses that satisfy the Writing Requirement cannot be used to satisfy requirements in the Jewish Studies Major or Minor. The Jewish history concentration within the History major focuses upon the historical dimensions of Jewish experience and the evolution of Jewish life in the context of the different cultures in which Jews have lived. The History major requires 12 c.u.s. Two out of the three general survey courses in Jewish history which treat the ancient (HIST 139), medieval (HIST 140), and modern periods (HIST 141) respectively. Three additional courses in Jewish history, one of which must be a seminar that contains a historiographical or methodological component. With the permission of the faculty advisor, JWST 390 Research/Thesis Seminar may be taken to fulfill the seminar requirement. Students may also choose to enroll in the History Honors program which requires a thesis. Two courses in Jewish Studies from other departments (including NELC, English, Folklore, German, Religious Studies, and Sociology). One course in American history, 1 course in European history; and 1 course in world history. Two courses that cover the pre-1800 period. Two history seminars at the 200 level or above. Although language courses will not be counted for the 12 c.u.s of the History major, students concentrating in Jewish history must attain second-year proficiency in Hebrew or Yiddish, either by passing the proficiency exam or by completing the four-semester Hebrew or Yiddish language sequence. The Hebrew/Judaica Concentration in the Department of Near Eastern Languages and Civilizations focuses upon the study of Hebrew language and literature as a window for understanding Jewish culture and its historical experience through the literary analysis of texts and artifacts. The major normally requires 14 c.u.s. If a student is a double-major and enters Penn with proficiency in Hebrew language, s/he may apply to have the major reduced to 12 c.u.s. Proficiency in Hebrew language, which can be attained either by studying these languages at Penn and completing the last level, by passing out of the requirement through the placement exam, scoring 700 and above on the Hebrew Achievement Exam (SAT II), or having gained an Israeli Baccalaureate. Both modern and Biblical Hebrew language courses -- including HEBR 059 -- may count towards the major as language or elective courses but not for the modern Jewish literature requirement. In special circumstances, students may petition to have another language substituted for use in the major. At least three courses in which Hebrew texts are read in the original. Minimally, these courses must include at least one text-course in Biblical literature (e.g. HEBR 250) ; one in Rabbinic or Medieval Hebrew literature (e.g. HEBR 257 or 258); and one in Modern Hebrew Literature (HEBR 259 or 359). Two "breadth" courses in NELC outside the Hebraica/Judaica concentration (eg., NELC 102 Introduction to the Middle East, NELC 136, Islam, Religions, and Institutions or NELC 101, Ancient Middle Eastern History). Double majors are required to take only one "breadth" course. Remaining electives in courses relevant to the student's fields of interest. No more than seven of these electives (half the major) can be taken in other departments or outside Penn. A "concentration" paper: In an appropriate class or seminar, the major must write a more ambitious paper which will serve as a capstone project for the major. A student need not take a special course to fulfil the requirement, but majors are encouraged to take the Jewish Studies Thesis/Research seminar to do so. The Judaism Concentration in the Religious Studies Department focuses on the study of Judaism within the context of other world religions and offers students the opportunity to explore the construction of Jewish religion in its different cultural settings. The major consists of 12 courses, four of which can be transferred from other departments or programs (in addition to all courses normally cross-listed with Religious Studies). At least two other courses on either other world religions (eg. Intro. to Christianity, Islam, Hinduism, Buddhism) or other methods of studying religion (e.g. Religion and Literature, Theories of Religion, The Cult Controversy). One Seminar in Religous Studies at the 400 level or above OR JWST 390 Research/Thesis seminar. Four electives, which may include courses from other departments. Of the above courses, at least one must be in each of the General Distribution sectors in which Religious Studies Courses are taught (eg. History and Tradition, Society, Arts and Letters). Although language courses will not be counted for the major, students are encouraged to attain proficiency in a Jewish language (normally Hebrew or Yiddish). Each of the major options offers students the opportunity to graduate with Honors; in most cases the Honors program includes a special Honors Thesis. For further information, students are advised to speak with the honors advisor in each department or program. In the Spring semester of their senior year, Jewish Studies interdisciplinary majors participate in an advanced research seminar. During the semester, students will conduct independent research on a topic chosen in consultation with a faculty advisor, and complete a 20-30 page paper. Students will work with individual faculty advisors in their area of specialty and also participate in a seminar meeting that meets periodically throughout the semester. In the seminar, students will discuss research methods and interpretive skills and share their work-in-progress. JWST 390 is required of all students majoring in the Interdisciplinary Jewish Studies major, but all majors and minors in the various departmental programs are encouraged to take the seminar. Students are advised to begin speaking with an advisor about their research topic during the semester preceeding the seminar. Participate in a senior seminar (JWST 390) where they complete a substantial research paper. This experience allows students to become experts in a topic that they choose. Majors also have the option of writing an honors thesis, in which case they enroll in a second semester independent study, in addition to the senior research seminar. As you graduate, we ask that you write a self-assessment (of no more than 4 double-spaced pages) that provides an overview of your experiences in the major. Please note: The personal statement is designed to help students reflect on their intellectual growth and to aid the faculty in assessing the strengths and weaknesses of the major. It will have no impact on final grades. To aquire familiarity with both the chronological and disciplinary breadth of the field. To attain proficiency in a Jewish language. To gain expertise in a particular subject within the field of Jewish Studies through completion of a substantial research project. In the statement that you attach to this sheet, please elaborate on the issues above and provide specific examples from your coursework, research, and other experiences in the major. explain why you chose to major in Jewish Studies. discuss 3-5 specific courses within the major that shaped your intellectual development. Please include title of the course if possible. indicate how your academic interests in Jewish Studies have evolved over the course of your education at the University of Pennsylvania. explain what motivated your choice of a senior paper/thesis topic. If a specific course or courses influenced your decision, please include that information as well. As you complete the Jewish Studies major, please indicate which aspects of the program you found most valuable and make suggestions for improvements in the course offerings and/or structure of the major. Graduating students should submit personal statements to the Undergraduate Director of the Jewish Studies Program no later than May 1 (or December 15, for those graduating in the fall semester).